You are here: Virgin Islands News Online » News » Festival schedule released; Line up a mystery! Festival schedule released; Line up a mystery! ROAD TOWN, Tortola, VI - Yesterday May 31, 2017 many rushed at the Training Division in Road Town to view a poster released by the VI Festivals and Fairs Committee in the hope of seeing names of especially international artists. But, oops sorry, all they found was the schedule for the 16 days of activities for festival 2017 starting on July 27. "On social media some have started commenting things like "boring", while others are complimenting the committee which seems to be having a good handle on things this year under the chairmanship of Mr Treffor A. Grant. It is his first time sitting at the head of the committee following the resignation of Ms Kishma A. Baronville. 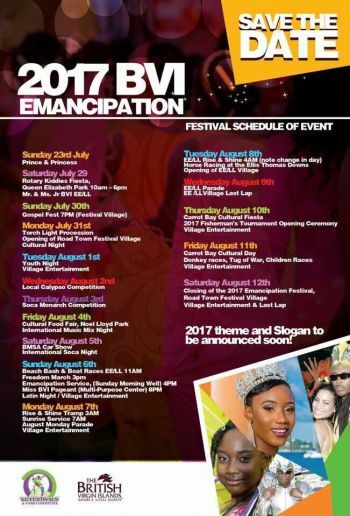 The widely circulated poster is also void of the names of whom the various festival villages will be named after and this year's theme for the emancipation celebrations. Bases on the schedule, East End and Carrot Bay will have two days each again this year. The BVI is the only country in the Caribbean where it is more expensive to get flights out during festival than it is to get flights in. That was stupid because all that poster did is give me heads up to starting planning to go festival else where. I did already mumu My comment aftered your life so much that you had to comment, oh wow. Just like the Pier Park we boycotting the festival in the village for pay. Enough of this we want to celebrate our emancipation. Everybody join in and demand free entertainment for the celebration of our emancipation fro slavery. The tourist are not using the pier park therefore events are being planned for locals to pickup the tab. Similarly, the emancipated people of the Virgin Islands will not pay for their emancipation celebration after government funds were used to bring the artist here in the first place. *Yawns* Nothing new. Same old, same old. Myrun needs to be slapped. east end jourvert moved from Wednesday to Tuesday morning?